MP PEB Jail Prahari Syllabus 2019: The online application forms have been presented by the Madhya Pradesh Professional Examination Board for the direct recruitment process of Jail Prahari. MP Jail Department Exam Syllabus might help you in your preparation. This exam is conducted every year to provide employment for the job seekers and a huge crowd of candidates applies for it every year. If you want to get selected then you will require the MP Jail Prahari Syllabus 2019 which has been described in the later sections of our article. Latest Update: MPPEB will soon conduct the Jail Prahari written examination 2019 for various vacancies. Applied aspirants can check the exam date & exam syllabus from here. 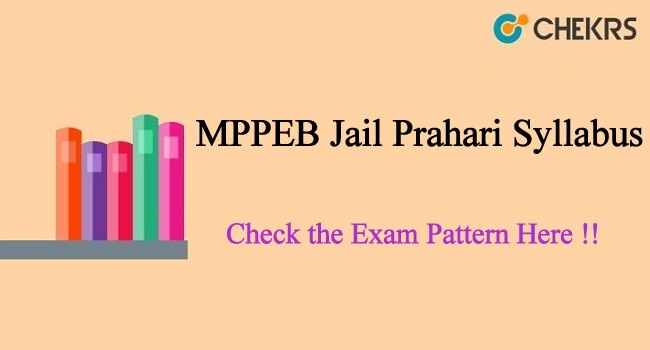 Check out the MPPEB Jail Vibhag Prahari Exam Pattern which has been specified below with the help of the tabular format. There will be ‘No Negative Marking’. The examination will be conducted in online mode. The below-specified table contains detailed information about the various sections of the included subjects. You need to cover all the topics of the MP PEB Jail Vibhag Syllabus in order to get satisfactory marks. Candidates can use the data provided in the MP Jail Prahari Syllabus to gain knowledge and apply it in their preparation. You can trust the provided syllabus as it has been prepared by the experts having a lot of knowledge. You can check the Previous Year Papers to get the practical idea about the exam scheme and yes, of course, it will help you out in your studies. Remarks: Do send your feedback regarding the content of the article about MP PEB Jail Prahari Syllabus 2019in the comment box and also send your queries and we will try to provide you the best solution.